Here is a review from Mark Shinn posted on Kiteforum. in a couple of days we will have our own demo teamed with the Zeeko Pocket Air board and Notus Air 8m hydrofoil dedicated kite. there will be demo's also in Perth and you may hunt down owners in NSW and Queensland, they'll be the ones attacking the waves. I don't often write here but when I have something I think is significant to say I will say it. Now seems a significant moment. Shinn has been selling Zeeko foils with our boards the past year and I was fortunate enough to receive Spitfire #01 last week which I promptly took to Tenerife with me for testing. As a passionate foiler (albeit not expert one) I am as keen as anyone to test it. My normal ride is a Zeeko carbon foil with Carver wing. I only ride Shinn boards (normally prototypes) - no surprise there then! I used the foil 3 times, once with the Ozone Chronos V2 UL 11m in marginal winds and twice with Blade 8m Skinny Boy wave kite in stronger conditions. Wind conditions.... unstable in all cases but I used the same kite with the Spitfire as I did with the Carbon/Carver combination. This foil is different. Very different. Not bad at all but if you are a foiler of a year or 2 you need to make some adjustments. I only used the Spitfire strapless so I don't have to worry about strap and foil position as I can move my feet at will but I did need to make several conscious adjustments to find the sweet spot. At first I was not convinced for lower level foilers, I ride with a GPS and at 22 kph I found the Spitfire very twitchy.... the canard appeared to be catching and dropping alot and it was hard to find a steady ground. After one run though I found that at 24 kph the foil stabilises nicely and at 26 kph it's very stable. NOTE I am talking KPH NOT KNOTS!!!!!! Once fast enough the foil is very stable indeed and tracks nicely. I felt I could drive it upwind fast. It feels normal, it is only at lower speeds that you feel the pitch control differently (or at least maybe I should say that I, personally, felt the pitch control differently). Early starting it is good, I'm not sure better than the carver wing but not alot of difference. The difference is that on the carver wing once you start foiling you have time to drink a coffee, adjust your harness, call the wife etc...... on the Spitfire you want to get on with it and accelerate immediately because I only achieve stability at higher speeds than the carver. Carving is ...... we'll, there is nothing to discus. It's fantastic. It feels more "natural" for a surfer. In fact, if I can apply my own logic I would say in a "normal" foil you have a wing and a stabiliser. In practise on this foil you have a wing and a stabiliser too but the stabiliser is in front of your back foot, not behind it.....it's a wonderful feeling for carving, I loved it but you have to maintain speed...... on a carver you can flirt with cavitation all the time...maintaining just enough speed to keep foiling, on the Spitfire you want to have more speed to maintain stability and at first it feels a little out of the comfort zone. On the Chronos I felt that the kite seriously hindered the performance in the turns. The kite is too much slower than the foil and you can't feel the benefits. On the 8m wave kite you can feel what the foil can do as the kite turns fast enough to keep up. OK, if you want fact stop reading now. The following is purely my "opinion". Beginners...... is this good to learn on? I have NO idea and I don't believe anyone that learns on a "normal" foil can comment. The feeling is different for sure and it took me some time to adapt... but if you have no experience at all maybe it is as easy to learn the Spitfire technique as the normal way .... time will tell but only when newcomers start with the Spitfire. Transitions - for any turns that I made without switching my feet I loved the Spitfire but I didn't master the foiling foot-switch yet. The timing is different but more importantly the speed. I normally bleed speed on the carver wing, switch feet then accelerate and on the Spitfire you need to switch with speed.... this is probably as much a failing of my technique as anything but I am writing an honest account of my feelings..... in 10 days I will be back in Tenerife and spend some more time on the Spitfire and may change my mind on this! So in summary..... is it a game changer? You'll have to ask someone else but I love the out the box thinking, I love the turn on it and I think it opens the door to the future. So thank you Nicolas and Zeeko....... indeed I think you made some people scratch their heads!!!! Thought you might like the initial review from Gunnar. You will have noticed that the wind was dying when I went out. I started on a 9m Enduro first, then switched to me 13 ChronoV2. Did not really have a lot of power with either kite. The Foil was at 27.5cm from the tail to the screws just as Nicolas recommends. I found this to be a bit to far back for my taste. Also this is my impression after about 20 minutes riding. Tomorrow when we have good wind again and waves I will have a bit more to say and will probably answer the questions in more depth in the final review video. How different is tacking and gybing compared to a race foil and other wave foils? A: Pretty much the same. I was having issues at first as I placing my foot to far forward. This is a setting thing that will easily corrected by moving the foil forward a bit. Does it feel sluggish like other aluminum foils? A: The opposite actually. It felt very lively compared to the other Alu foils I have here. How does it feel strapped vs strapless? A: I only tried it strapless today. Does it feel different or better jumping with it? A: Did not jump it. No straps today. Is it more or less pitch sensitive than a standard front wing design? It's the same. It was very pitch stable. Does it overfoil at higher speeds? I only got it up to 22 knots today. In that speed it felt really solid and I had not problems with ventilation, nose drops or blowouts. How consistent is the pitch stability as the AOA is changed? This was pretty good. I would not say its any better or worse than an normal foil. How consistent is the pitch stability at different speeds? Very. As soon as the foil engaged the pitch stability was great. Do the wings 'pump' in the same way as with a conventional foil? Not quite. This is were I found I needed a bit of time to get used to how the foil behaved. You don't get that fron foot feedback that you normally do when pumping a regular foil. So it takes a bit more sensitivity. 1) faster turning, pivoting on the rear foot, like hard carving a surfboard. Did you notice faster turning ability? Or did the turning feel different, in terms of back foot pressure and balance? Yes it turns faster. The foil has a much tighter turning arc and it is much easier to push into a turn. Did it feel different in the turn in regards to back foot pressure? Not that I noticed. It was more that the front foot did not "pressure" up during the turn. I managed to breach the back wing a few times on purpose. It recovered pretty nicely. I also managed to stall a few times when trying to pump it to aggressivly, but managed to recover without crashing. In that sense it behaved like a normal foil. Can't wait to try this - I'll have the spitfire plus the green & white in Perth and available for anyone to demo in the new year. Received my Spitfire today and proceeded to go down to my local flat water spot for intimate introduction. Removed the zeeko blue/white with carver wing and attached the Spitfire to the El Stubbo. Everything you need to build the foil comes in the bag. Nice simple task that took 10 minutes. With the carver I used the rear most position, with the spitfire, the foremost position (based on Mr Shinn's advice). The foil is not super heavy (compared to the SS hoverglide). You read all about front foot pressure on foils. You train your muscle memory to manage it without thought. Be prepared for some fun unlearning. I dived the kite, popped up the foil, pushed it down with the front foot, it responded immediately by popping the board straight back on the water, I popped up the foil, pushed it down with the front foot, it responded immediately by popping the board straight back on the water and so and so for the 500 metres. It was like porpoising but without the huge crashes. It took me while to think of my rear foot resting place for my weight and front foot almost like a lever, pulling up and GENTLY pushing down. Second run healside I started to get it, and found a balance. Toeside took me about three 500m runs to click. Managed a few on mast turns. Haven't quite cracked the weight transfer yet. Very easy to turn, got in some very tight turns with speed. This thing is super easy to swing left or right. Haven't quite sorted the stall speed yet, but it is higher than the carver. Pretty sure I will have dialed in after another long session. I think it might actually be a good beginners foil because of the back foot pressure and avoidance of huge crashes when you breach. Day 2: 24 hour break and to my surprise, no more porpoising....tick. Cruising along really well, great upwind and great speed. Started doing lots of on mast turns. Kept screwing them up because I had too much front foot pressure. Applied the "new backfoot pressure" rule as recommended... OMG can this thing TURN. Pretty impressed with what this thing can do. Now looking forward to some waves. Day 3: super choppy lake conditions (half metre wind swell), 20 to 25knots and 5.5 Cloud. Did a lot of breaching today during the on mast turns because of the size of the chop. Had a few crashes, but recovered most occurrences. Would have spent more time in the water on a normal foil. Having avoided wing chops and foil injuries over the past 2 years, I have collected three over the few days trying to achieve the same skill level I had on a normal foil. Almost worth wearing a helmet until I dial it in. Still haven't quite put together big sequences of carving turns, but yesterday's conditions would have made it hard for me on either foil. What's the price in Aus for the spitfire and board? $1600 for foil only. I already had a board. So I've managed to have 3 sessions on the spitfire since I got it last Friday, all in quite strong winds on small kites (3.5 &5.5m clouds). This in itself is a bit unusual for me as I usually foil in 15 knots or less, but I have to say the foil worked really well in these conditions. Fair to say I've ridden a few different brands and makes of foils and this one has required to most "unlearning" - it really is a different beast and very sensitive to front foot pressure. Improved Handling / manoeuvres are true to label in that she feels quite loose (my buddy said playful) in the water without any winglets or vertical stabilisers, and you can put a lot of weight on your back foot and carve a very right arc as a result - I think with experience this will be loads of fun in surf, but for now it's a bit of a crash fest. I feel like I'm back at square one in some ways. Ive paired it with the zeeko Air Race board - the one from the video- and this is much lower volume than I'm used to. As Other reviewers have pointed out, the Spitfire is only stable at speed, and at 90kgs on a smallish board it's been more difficult than I expected to build the speed required to maintain steady flight - rather I feel like I'm plowing along inefficiently with lots of porpoising and crashing. I had a couple of short runs with it mounted to my raceboard and that made life much easier with more volume to enable me to accelerate quicker. So the plan from here is to use the raceboard for a while to get a feel for how to ride the foil efficiently, and then switch back to the Air Race when I'm ready for waves. At speed the stance is like any other foil - neutral between front and back foot, and she goes upwind as well as any other foil I've ridden. Crashes are also softer - this was part of the design brief - that front wing ventilation will result in a softer contact with the water and this is true. It doesn't just drop you like you are probably used to. This makes it a bit more forgiving in this instance. So lots of learning at the moment but I'm pretty happy with it so far. Anyone looking to ride it ( or the conventional Green & White) please shout out and let me know. I'm usually riding at Pinnaroo north of Perth and have seen some of you on the beach already. Happy to lend you a board if you need it. At this time I can't send it interstate but will in time. Cheers. 5th session on the Zeeko Spitfire today and it's definitely coming together. Having moved the mast +10cm seeking an optimal position in the first few sessions, I've ended up back close to the recommended settings on the smaller Air Race board and it's working a treat. I'll put it down to the slightly different technique required initially that led me to start experimenting and wasting a few days. The design is definitely more forgiving than a regular design in the turns, you can literally carve around to the new tack and then whip the kite into position as an afterthought, as it just keeps you up off the water much longer than normal. Those of you riding regular foils will know that full foiling carving turns usually require a coordinated approach with kite and board together, timing is key. Not so much with the Spitfire. Also in sharper turns you can hear the wings breaking the surface and making a sucking sound, but nothing untoward happens ! This is usually a precursor to a wipe out on my other foils. Anyway, am pretty stoked for now. Will try and find some swell this week and see how that goes. Just have to say thanks to FedEx for finding and delivering our demo Spitfire. Was due on 23rd. So some anxious toing and Frowing. It will be bolting to our pocket Air board so no tuning foil position. This afternoon near Mordialloc I will have the Spitfire for anyone wanting to check it out. Just need the right beach to head for. Probably a bit late to reply, but further north is likely to be better. The wind is stronger in light sea breezes the further north you go. Two of us foil every evening at Hampton. It would probably be on right now. It's a nice sandy beach with a reef in a known position that's easy to avoid. There's plenty of beaches downwind to come in if things go wrong. Brighton has regular foilers, but more reefs and no escape options. St Kilda is, well, St Kilda. I had the chance to try out a Zeeko Spitfire on an Airace board this afternoon in Perth, during a downwinder from Floreat to Trigg, I don't normally write reviews, but thought it worthwhile as apparently not many people have gone straight from no foiling to tying the new spitfire design. So, for context, I've been kiting about 8 years, predominantly in the waves, with very minimal time on the twintip. In terms of foiling - absolutely bugger all. I have been on a mates foil on flat water once, for about half an hour I persevered. It was possibly one of the most humbling experiences I've had.... absolute numpty, I bucked the board out of the water a couple of times when I wasn't battling to turn the f*cking thing around the right way in the water - absolute disaster! I knew that if I persevered, I may be able to get going and get competent - but to be honest that first experience on the standard foil (can't remember the brand / model) was extremely frustrating! Fast forward a year to today. I was keen on a downwinder so hit up JamesPerth from Specialised to tag along, he'd been talking up these Zeeko Spitfires and was keen to try it out on a downwinder. Apparently the design is VERY different to a standard foil, with the large wing at the back and the small wing at the front, specifically designed for waves / swell riding. 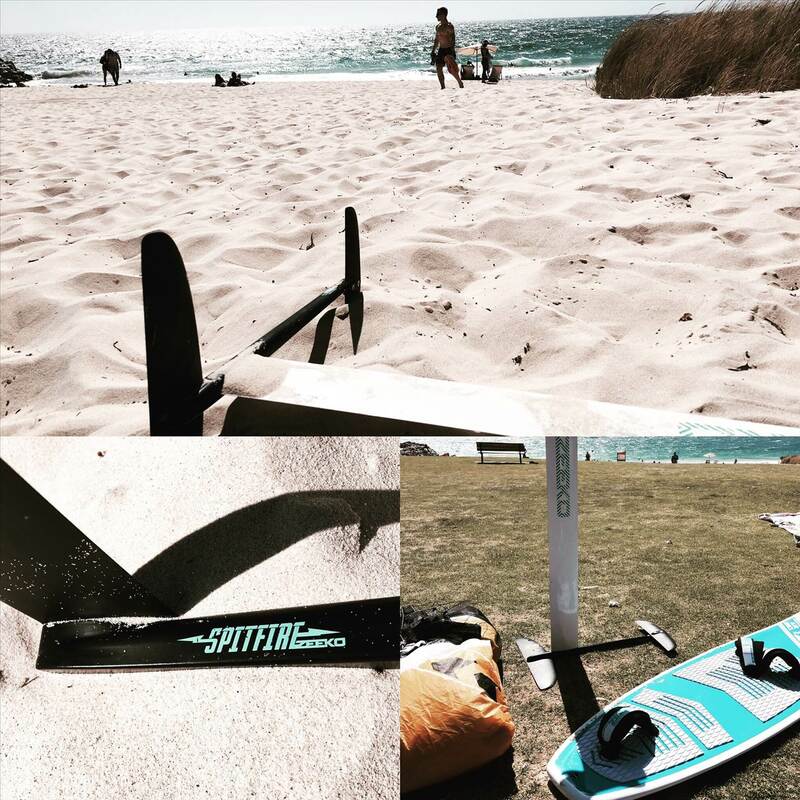 When we got to the beach I distinctly remember thinking - 'these foil things seem good for racing and flat water, but I just dont see the appeal for waves, particuarly in Perth with our beachies'... but was keen to give it a go in any case. We headed off from Floreat, the swell was about 1m (ish) at Cott, wind was a bit light at 1 to 18 knots, but I cracked out hte 9m Airush Wave anyway. We headed out, me on my surfboard, and James on the Zeeko. He managed to get through the small waves no problems. About Half way to Brighton we swapped boards. I honestly thought I'd get bucked around a few times, then desperately call for my board back... that wasn't the case! After a few failed attempts to get going, I managed to get up on the foil (going pretty slowly with an underpowered kite), bucking around a fair bit. The difference was, for each 'buck', the board headed back towards the water and then managed to get up on the foil againThis happend about two thirds of the time! I think this was a combination of the foil having the larger wing at the back, so when the foil 'bucked' the small foil came out of the water, but the larger wing managed to still give some lift, and the really fat nose of the Airace board keeping me from nose diving too many times. After about 20 minutes James was keen to have teh foil back so I relucantly returned it! He looked to have an awesome time, riding swells out the back, and coming in just before the breakers. I tried to get the foil back from James a few times, but he was having too much of a good time! James reluctantly gave me another go at Brighton, I managed to cruise most of the way out to the marker (1km offshore?? ), and had the intersting problem of not being able to get back in (toe-side was too hard for a first timer). Good thing James came back out and swapped board. So the verdict? Sign me up! my perceptions were completely turned around, this thing was amazing to try for an absolute first timer (sans half an hour on the river). Looking forward to giving it another go. Did my first downwinder today on the spitfire, with my buddy on his SB. You can see his commments above - thanks Al - We swapped a couple of times - he's a foiling beginner with a couple of attempts behind him but he was able to get a few short rides up on the mast today in lumpy water - I was well impressed. I'm interested in his feedback as a new foiler as to whether the canard design is suitable for learning. It appeared so - his touchdowns appeared less violent than those I remember when I learnt. The usual 14km run from city beach to trigg ended up 24 kms - I was obviously making much longer tacks riding the swells than normal, where we would usually stick to the shorebreak. That's is not going to work in this instance, in fact if you want to hack and slash everything in sight this style of riding probably won't interest you. But I thought it was magical seeing the ocean from this position 1m above the water, gliding up and down the ocean swells in near silence, with all the lumps and bumps flattened out into a smooth floating ride not unlike deep powder snow. Now I've foiled on the ocean before - that's not new but usually what happens in waves is the front wing ventilates and you explode from a height. This happened far less today - a couple of times sure but mostly this happened when trying to bottom turn toeside at speed and I'd lose reference of height. As soon as I let myself get closer to touching down during the carve it stopped happening. The extra rocker on the board means a touch down is of no consequence. Towards the end i was consistently linking 6-8 foiling turns together across multiple waves. This unconventional design really works - even kooks like me can ride legitimately ride waves with this thing !! We have been wondering how the Spitfire would work for beginner Foileurs. Albeit Al sounding very talented. Looks like I will be at St Kilda Saturday just after lunch with the Spitfire. so come check it out. hi guys just wondering if any news/progress of the reverse design wave spitfire foil.. is it worth upgading to for ocean riding? So far the Spitfire has proven a bit easier to adapt too than Zeeko warned us of. That being the conservative approach in claims of performance Zeeko are known for. What is also clear is that if you want a livelier feeling foil and are focusing your foiling on swell and waves. Then the Spitfire is the best choice. As feedback comes in, it seems there is starting to be 2 thoughts on how easy or hard the Spitfire is to adapt to. very experienced foilers take some adaptation but quickly get balanced then some time to relearn the back foot bias to start getting into what this foil is about. then there are the novice foilers to which the big challenge is the pitch control which is within a shorter range of CoG movement. Then there is the beginner who without knowing the difference may adapt as they learn. But not any feedback on this yet. At any rate after a session on the Spitfire, going back feels easier. But strangely dampened.